This is our last box with Farm Fresh Central and it held more than one surprise. The first surprise was this delivery came in a cardboard box. The second is how much lighter the box feels compared to previous weeks'. Perhaps it's because in terms of variety, this week's delivery has 2 items less. The third is how ripe this week's produce is. The tomatoes are usually rock hard, hard enough to possibly hurt someone if thrown right. But this week's tomatoes were well on their way to ripe-dom. As can be said about the watermelon and carrots. This is not a bad thing - it means I don't have to wait almost a whole week to be able to use the produce. All in all, the Farm Fresh Central shopping experience has been very efficient. The deliveries are like clockwork. Our credit card has been charged per week, rather than the one bulk payment when you order. Their newsletter is emailed every week or so. I enjoyed having such a large quantity of produce, though having that many oranges is a little nuts. The good thing though is Farm Fresh Central's ordering system would allow me to exclude any particular vegetable/fruit - an advantage for anyone with allergies. They're not organic though and more than enough to feed us through the week - with wastage. But with this box, it's time to try out the next company. 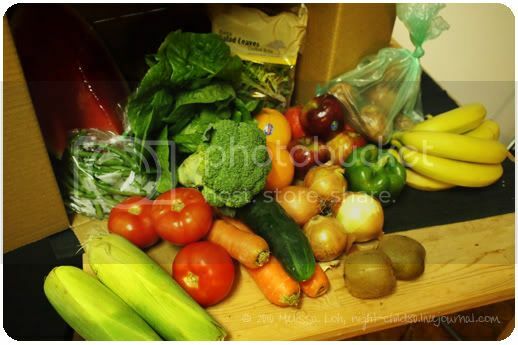 Do you have a fruit and vegetable box supplier to recommend?